Small business guru and author of "The E-Myth" Michael E. Gerber has written extensively on how to run a successful business. He describes his e-myth as two-fold: on the one hand, he discourages thinking people who start small businesses are entrepreneurs, and on the other hand, he warns small business owners not to think they can run a business simply because they know the technical work of the business. Small business owners need more than just technical understanding to be successful, and for pool builders this combination of technical and entrepreneurial prowess is hard to come by. Build a Systems Dependent Business. So what's the solution? If technical work is your strong suit, then Poologics acts as administrator for you in many respects. By automating your billing, scheduling, budget tracking, and so much more, you have more time to focus on what you do best. "After all, that's the purpose of a system--to free you to do the things you want to do," as Gerber writes. And if your strengths lie on the administrative side of the business, Poologics not only makes your job easier but also continues to generate new ways of improving, enhancing, and growing your business. Let Poologics be Your Entrepreneur. What we're talking about here is built-in innovation, and Gerber makes a distinction between creativity and innovation: "The difference between creativity and Innovation is the difference between thinking about getting things done in the world and getting things done...Innovation does new things." And Poologics does new things. With Poologics as an integral part of your business system, all facets of your business will organically develop without you having to do the extra legwork it requires. 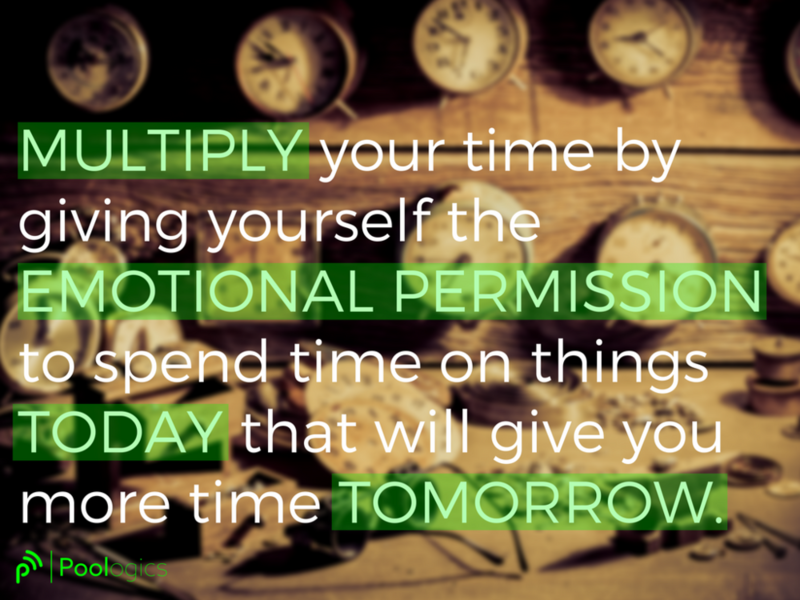 In his TEDx Talk on how to multiply time, Rory Vaden preaches, "You multiply your time by giving yourself the emotional permission to spend time on things today that will give you more time tomorrow." While dissecting time management theory, Vaden is urging business professionals - including you - to invest in themselves. By investing time in organizing, automating, and systemizing your business, you can reap the rewards of more time for family, friends, other important business tasks, or even vacation! Beyond investing time in yourself to multiply your time, Vaden also advises we delegate more of our tasks to others. Pool and spa professionals like you struggle with this every day. There is a certain panic that comes with delegating - the worry of tasks not being done properly or being done quickly enough or maybe even being done at all. But Vaden insists that the time it takes for an employee to be well-trained and well-versed in delegated tasks is time well spent: "Multipliers realize that perfection is achieved not only when nothing more can be added but [also] when nothing more can be taken away." Thus, by eliminating items from your to-do list, you are allowing yourself more opportunities for growth. Finally, Vaden calls for you to revolutionize your business. With his focus funnel, he demonstrates a three-dimensional way of managing time - factoring in the Urgency of a task, the Importance of a task, and the Significance of a task. 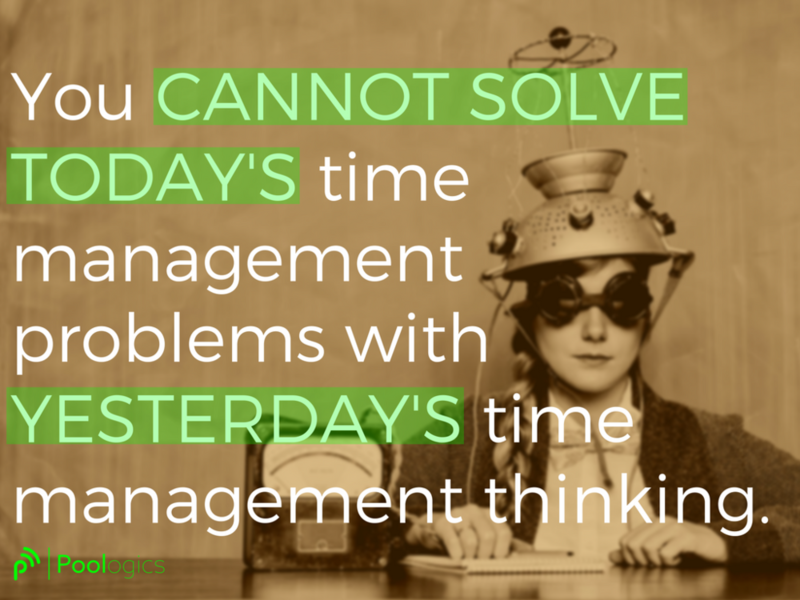 As Vaden says, "You cannot solve today's time management problems with yesterday's time management thinking." Instead of only doing what needs to be done right now, or even what needs to be done so badly, successful entrepreneurs like yourself should strive to do tasks that will better the future. Rather than looking straight down at what's in front of you, begging for your attention, look further ahead at a bigger picture in order to exponentially multiply your time and grow your business.